Running and sliding down Arapahoe Basin. When I arrive at the top of Arapahoe Basin’s Black Mountain Express chairlift, my running legs are starting to fight my mind. It&apos;s late summer and I’m only one-third up the 2,340-foot vertical climb. I can see the ski area&apos;s high point, Lenawee Summit, looming above and shrouded in clouds. My mind thinks “it doesn’t look too far,” but my legs beg to differ. I’m participating in the Discrete Cirque Series, a mountain running event designed to bring people together at their favorite winter destinations during the summer. 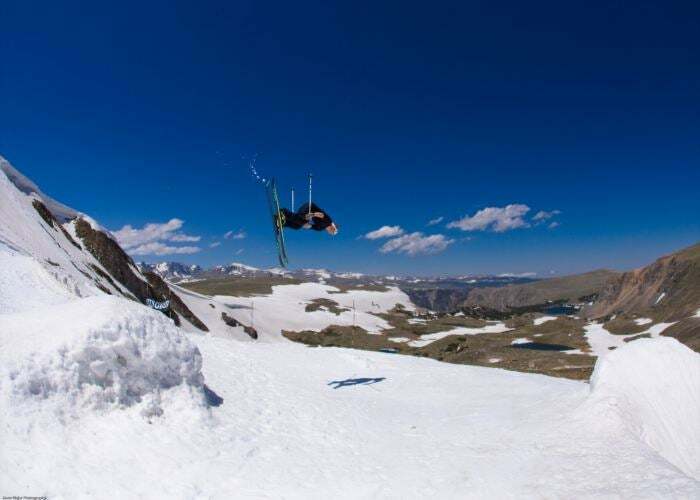 In its fourth season for 2018 with stops in Utah, Idaho, Alaska and Colorado, the Cirque Series is one of a few different mountain running series that have made strong efforts to diversify the number of summertime offerings at ski areas across America. What the event offers is a bit of suffering, but a whole lot of reward. “It’s a primal thing,” says Julian Carr, a professional skier who started and organizes the Cirque Series. “Every human is default-built to climb a mountain and come back down.” Add in the fact that ski areas have infrastructures to easily accommodate vendor villages, live music, liquor licenses, liability coverage, and can easily move volunteers and course workers up the mountain via chairlifts, they are a perfect spot to host a running race. Runners ascending Snowbird Ski Resort. At the top of Lenawee Summit, the clouds part and I can see Colorado&apos;s Rocky Mountains stretching for miles. I&apos;m towards the front of the pack, and there are plenty of other racers marching their way up Montezuma Ridge behind me. From here, all of the climbing is finished, so I let my legs rip down the mountain. At the sight of a snowfield, a number of runners, including myself, take a slight detour to slide down the snow in our trail running shoes. Based on the massive smiles on our faces, you&apos;d think we were all skiing instead of running. Carr isn’t the only organizer taking advantage of ski resorts’ pre-built infrastructure for running events. Under Armour’s Mountain Running Series is scheduled to take place at Copper Mountain, Killington, and Mt. Bachelor in 2018. The UA series offers a number of different races at each stop, ranging from five kilometers to a completely nutty 50k (31 miles), with a little to a lot of vertical gain during each race. Runners ascending the final climb of Arapahoe Basin&apos;s Lenawee Peak. After a quick descent that involved some more snow glissades and leap-frogging a number of other racers coming down the final switchbacks, I find the finish line back at the bottom of Arapahoe Basin. My legs are sore, but my mind feels refreshed. The atmosphere is celebratory as the course was shorter than advertised, and everyone I ran with achieved their goal of finishing with better-than-expected times. There was nothing left to do beyond enjoying a cold beverage and winning raffle prizes from the event’s sponsors. We all walked home with bags of swag. “I’m not a runner,” says Carr. “But I’m an adventurer.” And when the courses involve running up and down single-track, climbing over boulder fields, glissading down snow fields, incredible views, and a great after-party, it’s easy to see why Carr thinks of each race as an adventure with different chapters. The best part for everyone comes just after the finish line.